Thinker thunker body ratios, Bob vs Patty. Thinker Thuinker has the width of that tree at 18"....but, John Green had actually measured the width of it...and his diagram has it labeled as either 8", or 12" in diameter. I think it was 8". I just looked on-line for his diagram, but wasn't able to find it. I'll keep looking, and when I find it I will post his measurement. Btw, Patty was less than 7' tall. Looking at the picture and the surroundings, I highly doubt those trees are only 8 inches in width. A smaller tree is going to exhibit branches and leaves lower on the bole of the tree. And I do not see any evidence for that in the frame. The naked boles go out of frame. Also looking at the larger evergreen trees in the frame, the deciduous trees look way bigger than 8 inches in width. If you could find John Green’s notes that would be great. It's my "opinion" that she's 6'3" in walking posture. Based at my opinionated approximation, IF Patty was even with that tree then it's 15 inches across, based on the TT video. I have no idea how far behind the tree she is, but Since she is behind it. this means the tree is smaller than 15 inches, in my opinion. 12 inches seems like a good estimate to me. Knowing the distances from the camera to Patty and the tree would help clarify this tremendously. I think they are bigger than 12 inches as well. Nothing adds up that she is 6’3” tall. I’m that tall and I have a 11”x4” foot. Patty is what 15”x6”? I have no problem believing she is 7 ft tall. Was this what you were lookin' for SweatyYeti ? That's it, Pat! Thanks for posting it! Now, I've got to look at those numbers closely...and see if I can tell exactly what John wrote. Upon further review it looks like 18-12-8?. They all look roughly the same size to me. That's what the numbers look like to me, too, Norse....but I don't think the measurement that looks like "18" is actually 18. 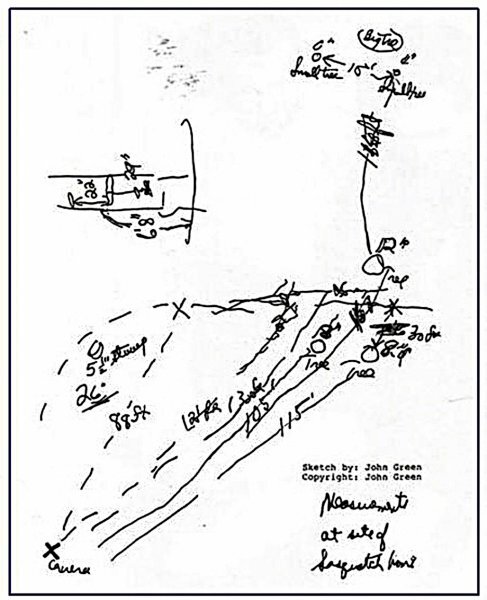 The tree on the far right...(Tree TC-2 in Bill Munns' filmsite diagrams)....looks pretty definitively like it's marked as 8". So, the tree to it's left...(which is tree TC-1 in Bill Munns' diagrams)....couldn't be more than twice the width of tree TC-2. The two trees are only 12' feet apart...and close to the same distance from the camera. I will post a graphic tonight, or tomorrow....illustrating what I'm saying. I agree in relation to the size of the two trees not being 10 inches apart. But those trees look more mature than 8 inches. Also to clarify these trees are red alder and not quaking aspens. Looking at frame 352 though. If those trees are only 8 inches wide looking at Patty’s thigh being smaller? I think she becomes smaller than a human. Certainly smaller than me. Well, tree TC-2 looks like it was measured as 8" in width/diameter. That measurement is not really up for debate....or, for our own arbitrary adjustment. If that equates to a relatively short height for Patty...in the 6' range....then, so be it. There is no solid analysis which gives us a height for Patty of 7', or greater. 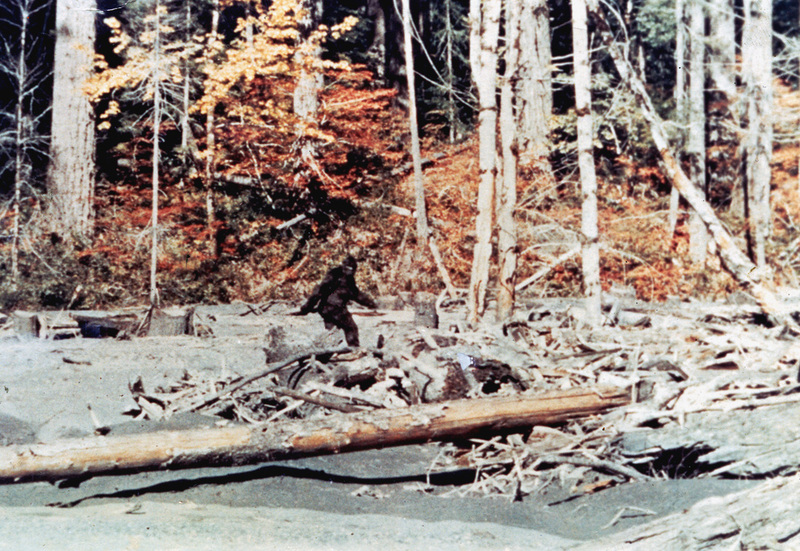 Maybe Patty was on the short side....for a Sasquatch. I'll post something more regarding John's measurement diagram later today...with additional images/info on those trees. 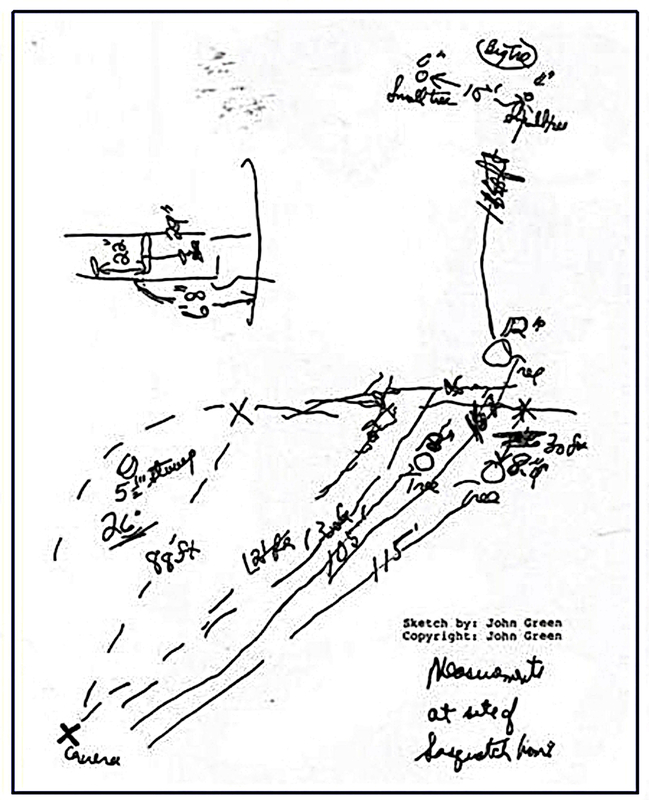 One detail worth noting, on John's diagram....it looks as though he drew the circles for the trees very roughly 'to scale'. That pattern in his drawing would seem to indicate that trees TC-1 and TC-2 are close to the same diameter....and smaller than the 12" tree. Well it is up for debate. Because we can both agree there isn’t a 10 inch difference between the two front Alder. So is it 18-12-18? Or is it 8-12-8? The left tree is written as 18. So maybe the 1 isn’t a 1, but some sort of line. Or maybe it is a 18 and with the right tree he forgot to write down a 1 in front of the 8. Because based on the frame observation there is no way it is 18-12-8. Either way the left tree was written down as 18. IF the tree is 18 inches wide? Then thinker thunker nailed it. As that is the tree he bases his hypothesis on at 18 inches. He must have had access to this same diagram, because that’s the exact size of Aspen he chose for the test. I do not think Jim McClarin was off track much at all. But obviously Green could not have known exactly where Patterson had been standing. I think the deviance of the two films comes from the camera position more so than the film subject. But whatever, I think Thinker Thunker’s comparison is the better of the two if the tree width of 18 inches is correct. The tree which is furthest back...(of the 3 trees)....is clearly labeled in Green's diagram as 12" in width. Since trees TC-1 and TC-2 are significantly closer (to the camera) than the 12" tree...and appear the same in width.....that would mean that those 2 trees would have to be less than 12" in width. Does it not?